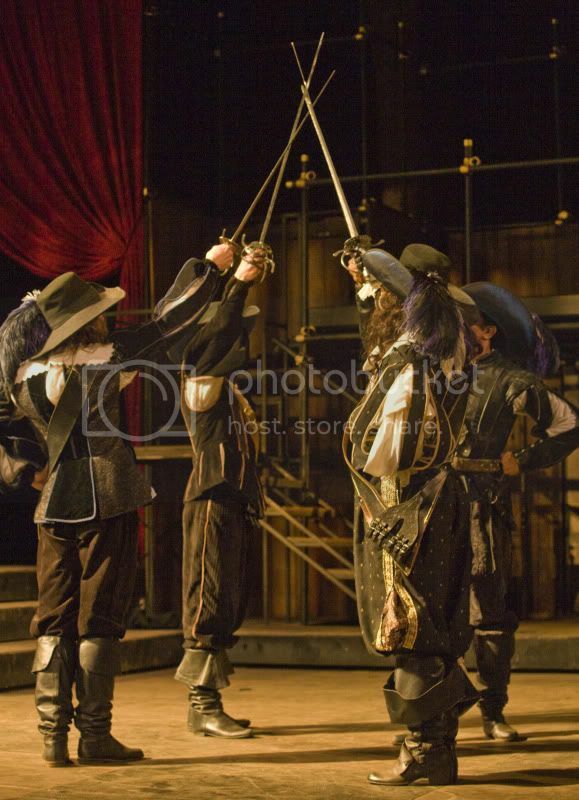 “All for one, and one for all!” The Three Musketeers (Kit Wider, Allen Gilmore, and J. Todd Adams) with D’Artagnan (Leigh Miller) in Shakespeare Santa Cruz’s 2011 production of “The Three Musketeers” (photo by rr jones). I read The Three Musketeers by Alexandre Dumas when I was nine or ten years old, unabridged, because my mother was a teacher and didn't believe in sugary cereals *or* abridged books. I tore through it an a day (ah, summer), and despite the fact that it's been almost 20 years since, I remember enjoying it. I also have seen two of the eight million film adaptations, my favorite being the all-star Disney Cast. Feel free to lose all respect you ever had for me, I also LOVE the first two Mighty Ducks movies. And Newsies. If you have somehow managed to miss any references to The Three Musketeers, it's basically a story about bros, brawls, and babes. I might paraphrase. Let's talk about the acting first, shall we? There were lots of familiar *voices* from previous productions at Shakespeare Santa Cruz. I say "voices" because this is a Hair and Costume drama. SO. MANY. HAIRPIECES. I know it's necessary for historical accuracy, but the wig budget for this show must have been through the roof. It also obscured a lot of the familiar faces, which is a pity since the actors are *so* handsome. Repeat attendees with an ear for voices (ahem, me), will recognize many of the distinctive voices onstage. The acting was stellar- Charles Pasternak, who was my favorite Romeo EVER (take that, DiCaprio) played an utterly foppish and convincing King Louis. (Andrew didn't recognize him at ALL, which speaks to how much Pasternak changed his voice and carriage for the role.) J. Todd Adams (who has been in every production in the Festival Glen I've had the privilege of seeing) played a soulful and (occasionally) tortured Aramis. Kit Wilder plays a delightfully lecherous Porthos, and Allen Gilmore plays Athos with command of the stage, and presents the major plot twist towards the end of the show with sincerity. Leigh Nichols Miller played the young and enthusiastic D'Artagnan well, my only complaint was his *incredibly* distracting hair. Among all the wigs, here was D'Artagnan with what was either a poorly done bleach job, but looked more like an experiment with Sun-In gone wrong. If the lighter hair was an intentional costume part (to represent youth, light, all that is good), I wish they had done a better job. Or covered that hot mess up. The interpretation of the book - which I'll admit, is no easy task - was entertaining, but choppy and disjointed at parts. It felt like the folks adapting the novel were just trying to include *too* much. There were quite a few 30 second scenes that could have accomplished the same amount of exposition with an explanatory line instead of a scene change and an incredibly short scene. I would have traded all of the shortie scenes for more development of the characters- like how D'Artagnan kills a man, and only seems troubled over it for the few moments between then and then end of the scene. Not only did they completely disregard any real conflict he may have felt, but it mostly left me feeling cheated out of any real exposition there. Was it better than a movie adaptation? It was different. Despite what I felt were adaptive shortcomings, I still really enjoyed the production, and I would recommend attending. If you're a slave to the original, this might not be the play for you. If you're up for a fun show with sword fights and camaraderie, go for it. Purists, re-read the book and NEVER see an adaptation of a book, they'll always leave you cold.